Tugdual Grall is a Technical Evangelist at MongoDB, an open source advocate and a passionate developer. 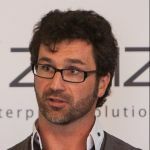 He currently works with the European developer communities and Mongo Partners to ease the NoSQL adoption. Before joining MongoDB, Tug was working as Technical Evangelist at Couchbase. Earlier Tug was CTO of eXo the company behind the revolutionary online development tools Cloud-IDE and the open source social platform eXo Platform. Earlier Tugdual has work as Product Manager and Developer on the Oracle Middleware focusing on Java EE platform.